Switzerland 1952 Telecomms Anniversary Set. SG532-SG535. Unmounted mint 1952 Telecomms Anniversary Set. SG532-SG535. 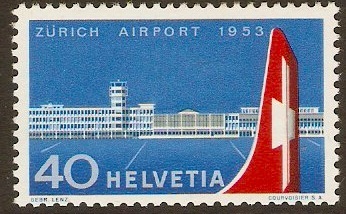 Switzerland 1953 40c Airport Inauguration Stamp. SG546. Mounted mint 1953 40c Airport Inauguration Stamp. SG546. Switzerland 1953 Mobile Post Office Set. SG547-SG548. Unmounted mint 1953 Mobile Post Office Set. SG547-SG548. Switzerland 1954 Publicity Set. SG549-SG552. Unmounted mint 1954 Publicity Set. SG549-SG552. Switzerland 1955 Publicity Set. SG558-SG561. Mounted mint 1955 Publicity Set. SG558-SG561. 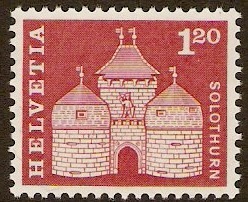 Switzerland 1956 Publicity Set. SG567-SG570. Mounted mint 1956 Publicity Set. SG567-SG570. Switzerland 1957 Publicity Set. SG576-SG579. Unmounted mint 1957 Publicity Set. SG576-SG579. Switzerland 1957 Europa Stamp Set. SG585-SG586. Unmounted Mint 1957 Europa Stamp Set. SG585-SG586. Switzerland 1958 Publicity Set. SG587-SG590. Unmounted mint 1958 Publicity Set. SG587-SG590. 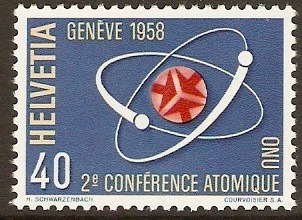 Switzerland 1958 UN Atomic Conference Stamp. SG596. Unmounted mint 1958 UN Atomic Conference Stamp. SG596.